Why Zero Grain may be Better for your Dog. Nutrish Zero Grain Dog Food. We are dog people around here. Always have been. I remember growing up we had 2 dogs, Buck and Ginger. Buck was a boxer, great dane mix and looked just like a boxer but was the size of a great dane. Ginger was a pure bred boxer. My mom used to say they would follow us around the yard just watching us and making sure that we were safe. I remember that because Buck was so big we used to take turns riding him like a horse. So when I grew up and got married, I just knew that I wanted dogs. It was a must. My husband agreed. And seeing the way our dogs interact with our children, I know they are such a valuable part of the family. It all started with Ithaca. 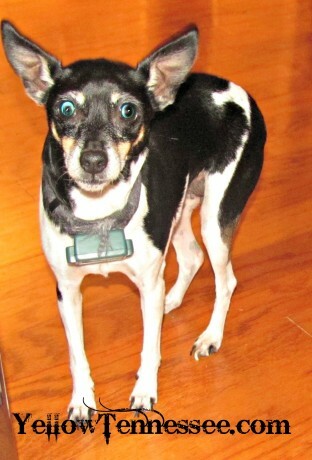 Our rat terrorist, I mean terrier. She at 9 years old is now our little old lady. Opting to spend most of her day sleeping. But she is always up for some lap time and pets. She has also learned to wait until Miss Stalin is calm and watching a movie to climb into her lap. Ithaca has learned this is a sure fire way to get some sweet cuddles in. When Genghis was 2 we decided it was a good time to add to our family. 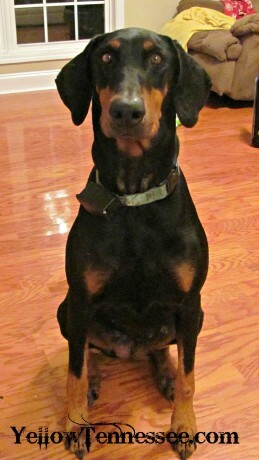 We talked about and researched what kind of dog would be best for us and in the end decided on a doberman. Benelli is hands down the best dog I have ever owned. I love this dog. And if we are being honest, she is my favorite. I love them all but Benelli is my girl. And Genghis is definitely her human. In many ways they grew up together. So you can always find Benelli wherever you find Genghis. She is always watching over him. And they play non-stop. Seeing how Benelli and Genghis bonded we knew that we wanted another big dog that could not only play with Benelli but also become Miss Stalin’s dog. Masada is just that. She is high maintenance and very needy but she has quickly become just as much a part of the family as the rest of the dogs. If only I could shave off all her hair, I think we would get along so much better. But feeding them can be a challenge. Especially when you are feeding 2 large dogs. The amount of food we go through in a week would amaze you. It is about more than just cost though. We want our dogs to be around for as long as possible. And that means taking care of them as best we can. So when I was offered the chance to try out Nutrish Zero Grain dog food, I was very interested. Like you, Rachael Ray wants the best for furry family members like her Isaboo. That’s why she worked with a team of pet nutrition experts to create Nutrish® Zero Grain™, a pet food made with simple, natural ingredients that doesn’t contain any grains, gluten’s or fillers. U.S. farm-raised turkey is always the number one ingredient, as it’s easily digestible and may help to avoid an allergic response to food allergies. Carefully selected ingredients like whole potatoes, peas and tapioca are the easily digestible vegetable carbohydrates in Zero Grain. It’s a natural and wholesome grain-free food that may be more allergy-friendly for your dog. Plus, Zero Grain is available where you currently shop for your family’s groceries, and proceeds benefit Rachael’s Rescue™ — an organization that helps animals in need. The idea behind a grain free food is pretty simple and makes a lot of sense. Nutritional philosophy shows that dogs, based on their primal ancestry, thrive on a diet mainly comprised of meat. By eliminating the grains that most dogs don’t need anyway, you also eliminate the possibility that food intolerance or allergies may develop to commonly used protein sources. Over the next few weeks I will be tapering our fur babies off of their regular dog food and onto Nutrish Dog Food. Then I will do a follow up blog post talking about our results. Dogs’ natural diets are low in grains. And while carbohydrates are an important part of the their diet, they shouldn’t be the staple of a healthy, balanced dog diet. That’s why real meat is the number one ingredient in all Rachael Ray Nutrish® foods for dogs. 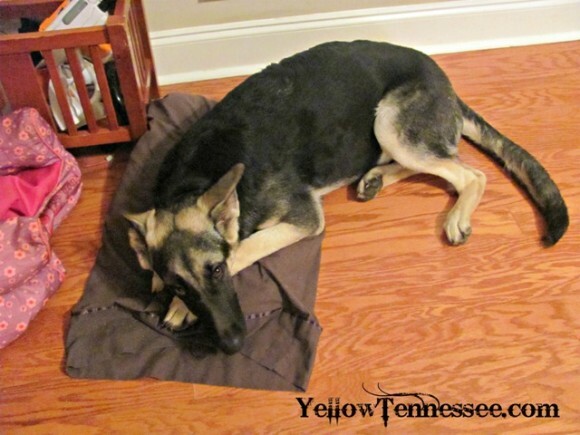 Some dogs also have grain and gluten allergies that can cause skin irritations or other problems. These dogs can benefit from a natural, grain-free and gluten-free diet like Nutrish® Zero Grain™, which removes the grain and gluten allergens. 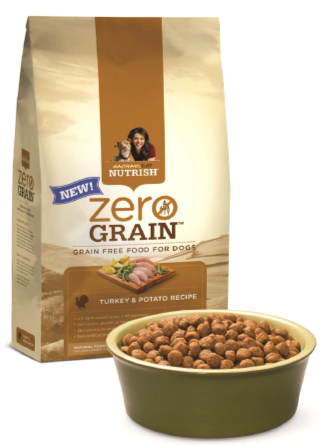 Nutrish® Zero Grain Turkey & Potato Recipe is a natural food that doesn’t contain any grains, gluten’s, by-products, fillers or artificial ingredients, so it may be a more easily digestible and allergy-friendly option for your dog.